One of the most successful Music, Sound and Electrical Goods retailers in Australia is JB Hi-Fi. There are over 160 stores in every state and territory of this wide brown land. But that is not how it began. Originally there was one JB Hi-Fi store just as there was one John Barbuto, the man who provided those now-famous initials. Mr Barbuto’s philosophy was simple: run an efficient, no frills business that aimed to undercut the bulk stores and massive retail chains. (Brief pause for ironic reflections.) His store was located in a minor shopping area in north-west suburban Melbourne. In this crowded, cluttered environment JB stalked the floor, unlit cigar clenched between his teeth, scowling at staff and customers alike. I vividly remember my very first visit to the original JB Hi-Fi store in Centreway, East Keilor. It was in the late summer of 1983 and I was a couple of months into my term as President of the Students’ Association at Melbourne College of Advanced Education. My friend André asked me to come along to this shop selling records and stereo gear to listen to some speakers he was thinking of buying. Sure, why not? So the following Saturday morning we rocked up to the unprepossessing shopfront and eased our way in. It required some navigation because the place was packed. André being a man of imposing bulk, I followed him. As we got past the entry log-jam it was easy to see that although there were indeed numerous customers, the explanation for the crowded feel lay in the ratio of stock-space to floor-space. There were record racks on the right, there were record racks on the left. There were piles of accessories and bins with headphones. Boxes of excess stock glared down from overhead shelves. And that was just the music section. The audio gear was in the adjoining room, a labyrinth of speaker towers and stereo cabinets. But I didn’t make it as far as the hi-fi room. Not immediately. My eye was caught by piles of LPs stacked on the floor. It smelt like a sale to me and I dropped to my knees, muttering to my mate that I’d join him ‘in a minute’. He grinned indulgently, knowing my double-trouble penchant for LPs and bargains. And what bargains there were. These were new records, sourced from goodness knows where, all marked down to – cue breathless quivering strings, if you please – a dollar. That’s right, a buck a pop. One hundred cents. All new, some recent, many sealed. And all bearing the tell-tale black felt-pen $1 scrawl of Mr JB. Thirty years later I still occasionally encounter one of JB’s mark-downs in second-hand record shops – usually priced at considerably more than a dollar! – and smile at the memories of scrabbling along the grubby carpet, vacuuming up albums while keeping an eye peeled for the dealers. Oh yes, dear reader, word got around. I got to know those furtive, skulking types with their sunken cheeks and foetid breath. I recall the stomach dropping moment when the excitement of arriving at JB Keilor plummeted as I walked in the door and saw the malnourished frame and glinting eyes of a known market-stall dealer over half-way down the floor-level row. Too late! Too late! Woe is me! Today I might have to check the $5 racks! Considerably more than a minute later I staggered into the audio part of the shop and found André. I was pink of cheek and panting slightly from the weight of the records I was lugging. Or perhaps those symptoms and the glazed look where simply the signs of post-collecting flush. I was hooked, no doubt about it. Almost weekly I made the pilgrimage along the Tullamarine Freeway to that den of vinyl iniquity. 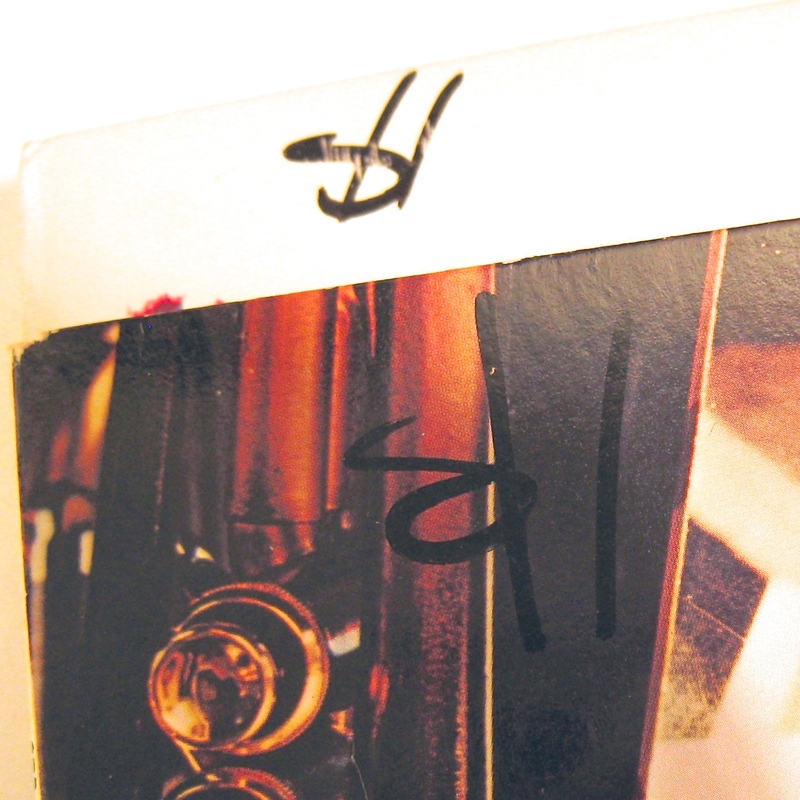 The best moments were when JB had his marker in his hand and was pulling records out of the other racks. He’d collect an armful, decapitate their price with a stroke of his magic felt-pen, and deposit them on the floor. I dropped to my knees and gave thanks. It did not last very long, that wonderful relationship. Perhaps a year? Eighteen months at most. Compact discs were coming and JB had an eye for trends. Slowly the vinyl racks faded while the bins of little silver discs swelled. But along the way, he shrewdly bought up vinyl bundles whenever he could and used the $1 corridor as a loss-leader. Sure worked for me; I probably bought several hundred albums from that shop, though I never once had a smile of greeting returned by John B. When one is vacuuming up LPs at that rate, you inhale anything that looks interesting. At a buck each, who wouldn’t? The Vinyl Connection tastes were already pretty variegated, so taking a punt on something unknown was appealing. Some of those records ended up culled and are long-gone, but others paid rich dividends. A case in point was an album with a most intriguing cover. Now any serious record collector will tell you that there are many things you quickly assess when glancing at an unknown album. 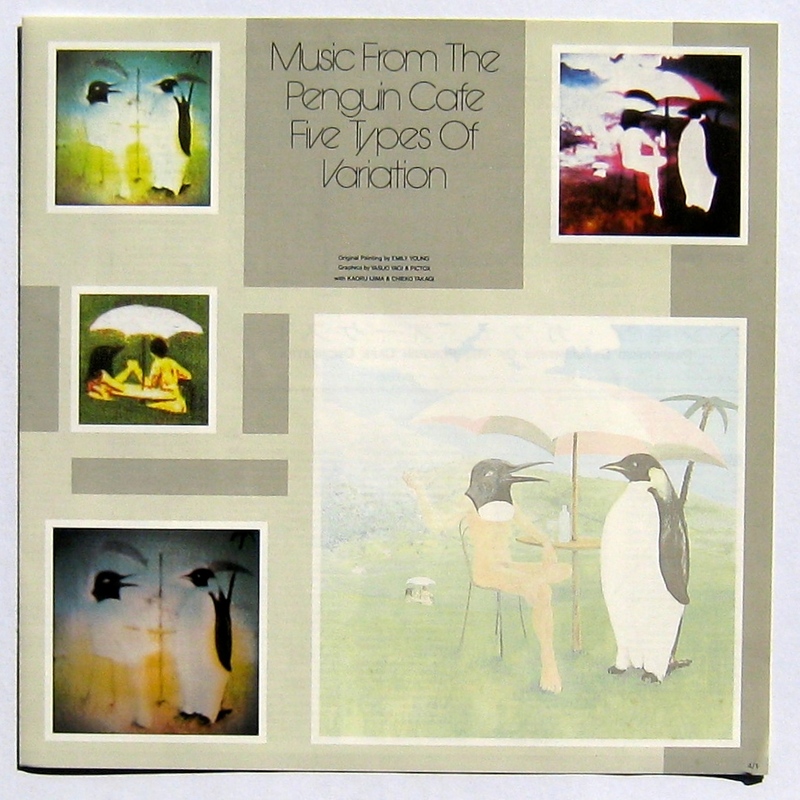 Music From The Penguin Café was on the obscure imprint of the Editions EG label. That’s Brian Eno’s label. Good start. 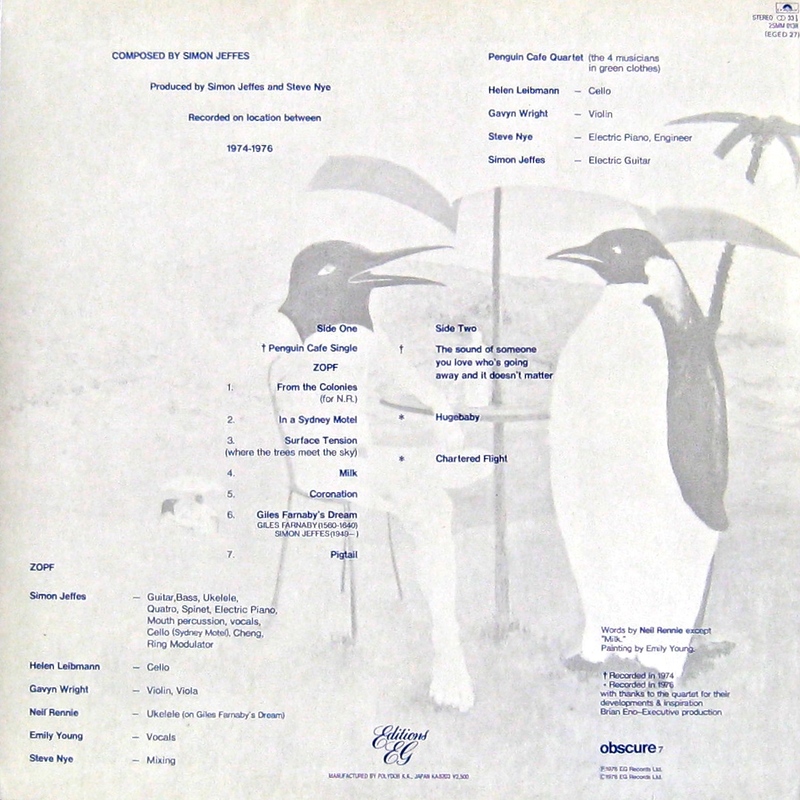 It was a Japanese pressing which almost earned it immediate inclusion, such pressings being justly lauded as being of reliably brilliant quality. The band’s instrumentation was unusual to say the least. This was clearly not a rock combo. But what tipped me over that day was one song title. Even amongst the noise and bustle of Saturday morning retailing it captured me entirely. Even now I get a tiny shiver. 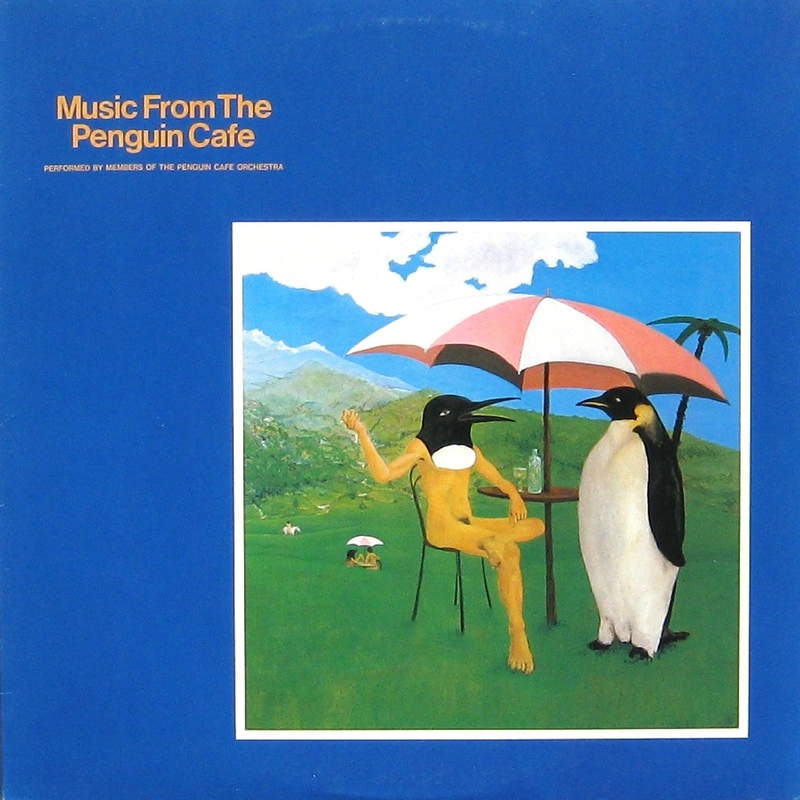 So the Penguin Café Orchestra were taken home in a yellow plastic JB Hi-Fi bag and proved themselves to be a wonderful addition to the collection. Hard to describe and impossible to categorise in a word or two, the PCO were the brainchild and much-loved project of composer Simon Jeffes (now sadly deceased). Theirs is a music at once cheerful and heartbreaking, mischievous and moving. Always slightly mannered (which distances it for some listeners) and never less than tasteful, the PCO had some success during the 80s and continue – without their visionary leader – to this day. Alternatively, you could have a listen to this piece that demonstrates several of the above characteristics. 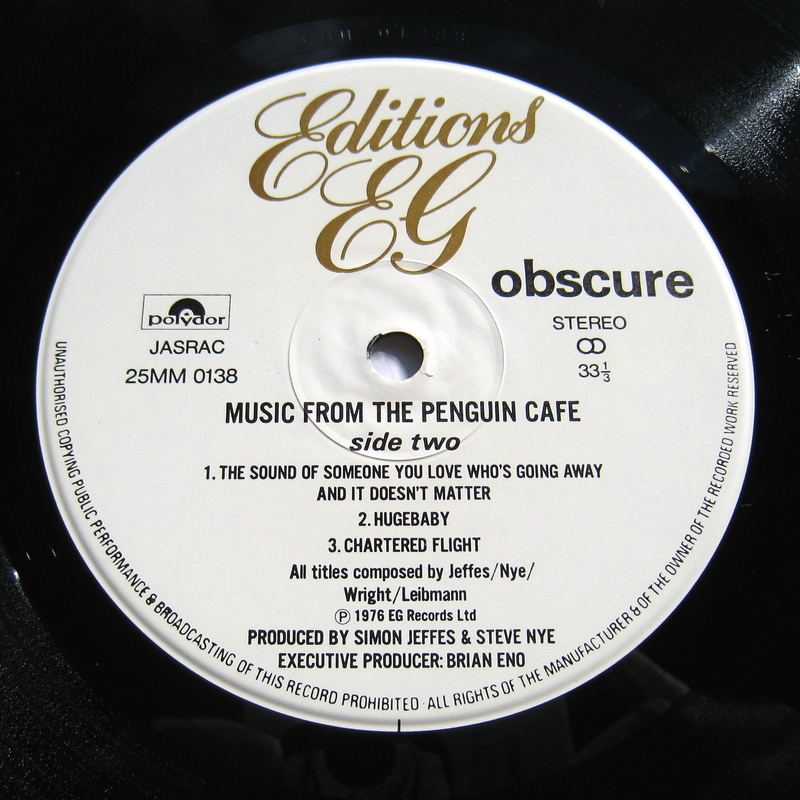 It comes not from the above first album – which is more experimental than later work – but from the second, eponymous release Penguin Café Orchestra . This was my answering-machine music for much of the mid-80s. Enjoy. John Barbuto sold JB Hi-Fi in late 1983, though he was retained as manager for a period. I believe it is now owned by a bank but that may just be hearsay. A) is there a spiky goblin/robot creature on the cover? B) do any of the song titles have swearing in them? Sadly, I fear PCO would have failed the 1537 test on both grounds. Well obviously yours are the primary criteria. But as that does limit purchases a tad, I would humbly offer the above as a second line. And your supposition is correct: no goblins within coo-ee of PCO. I go for robots, too. That’s one of my criteria. Of course! The sound-byte of that fabulous film ‘Malcolm’. Your post reminded me that I made a mental note to listen to some PCO 20~odd years ago (nothing to do with Malcolm). What a lovely quirky little film was “Malcolm”. i’d forgotten they used a grab of the PCO. In the right mood, I still enjoy the music very much. Hope you do too! LOL, LOL, a thousand times LOL! Now I can add JB Hi-Fi to the electronics store, the terrifying beach, the apartment with the loud music playing neighbor, the childhood home in the suburbs, etc. and further expand my mental images of your life in the land down under. Love it! Ha! Of course you know I’m only writing about the highlights here. The rest of the time I’m like any other Aussie: wrestling kangaroos off the front lawn, surfing with Jaws-sized sharks and taking tea with Kylie. Wouldn’t want you to get the idea it’s all as exciting as this post. Right, I’ll keep that in mind. And careful with those kangaroos, I hear they’ve got a mean kick. Lol!